Sophomore forward Jakob Forsbacka Karlsson became the third Terrier to depart the program prematurely, signing a three-year entry-level contract with the Bruins. Unlike Charlie McAvoy who signed an ATO with AHL Providence, the Stockholm native has reported to the NHL club and has been practicing with the team. JFK scored 63 points during his two seasons at BU—14-19-33 this past season and 10-20-30 last season. "It's very exciting right now...nice to get the first practice done with." The Boston Globe’s Fluto Shinzawa examines the Bruins’ development plans for McAvoy, who has two assists in his first two starts with Providence. 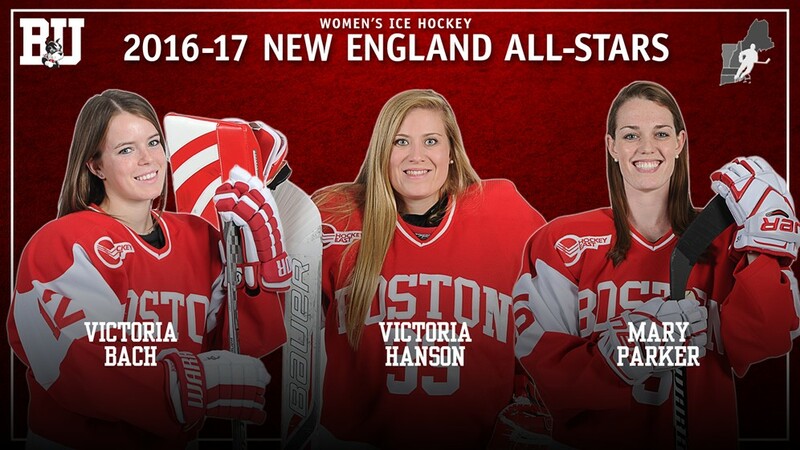 McAvoy, Jake Oettinger and Clayton Keller have been named to the New England Hockey Writers' Division 1 All-Star team. In addition, Keller was selected as Top Rookie. ►The 2016-17 BU Men’s Hockey Season Banquet is set for Saturday, April 15 at 11 a.m. at Agganis Arena’s Francis D. Burke Club Room. 2017 recruit Hank Crone— who has 58 points (24G, 34G) in 54 games for the Fargo Force—featured by USHL. NHL Central Scouting, which will soon announce its final rankings for the 2017 draft, has identified 2017 recruit Brady Tkachuk as one of the top prospects for the 2018 draft. Tkachuk, who has a 22-23-45 scoring line for the U18s, missed eligibility for the 2017 draft by just one day. Tkachuk is one of four future Terriers named to Team USA for the 2017 IIHF World U18 Championships. He’s joined by fellow 2017 recruits Logan Cockerill and David Farrance and 2018 recruit Joel Farabee who was called up from the U17s in February. The tournament begins April 13th in Slovakia. The Priority Selections scouting service has ranked 2020 recruit Trevor Zegras as the #2 prospect for the upcoming OHL draft. Zegras, who led Avon Old Farms in scoring with 42 points (18G, 24A), is expected to play for the NTDP U17s next season. HockeyProspect.com has ranked 2019 recruit Case McCarthy at #5 for the OHL draft. The biggest leap comes from Trevor Zegras, who is coming off an excellent season with Avon Old Farms and has taken his game to another level starting with the US Select 15 camp last summer. Yeah, there will be some sticker shock seeing him that high; but let's not forget that the dynamic forward put up an impressive 42 points as a true sophomore in a very tough loop this year. Not many would have pegged Joel Farabee to be the best forward on the Under-17 team this year, but we think Zegras could find his way into that similar conversation next year. After an excellent showing at the NTDP Selection Camp, we're comfortable slotting Zegras in at the 2-hole and look forward to seeing how his 16-year-old season unfolds. 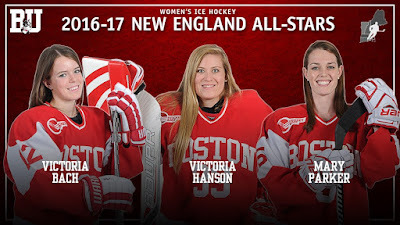 Three Terriers have been named New England All-Stars by the New England Hockey Writers’ Association: senior goalie Victoria Hanson, junior forward Victoria Bach and graduate student Mary Parker.